Donald Glover directs Episode 10 with a clear, compelling message: "You are a black man in America. Your clothes are important." Even before the principal delivered the fateful news about Devin, “FUBU” carried a lot of weight. 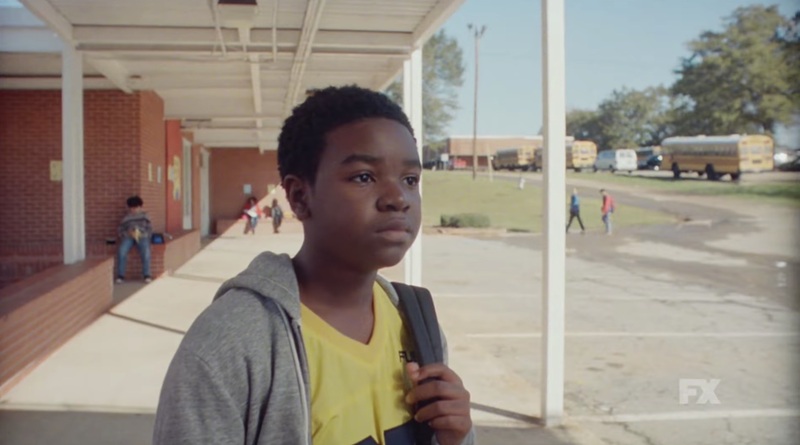 Following up last week’s fateful fissure between Earn (Donald Glover) and Alfred (Brian Tyree Henry), the penultimate episode of “Robbin’ Season” flashed back all the way to the cousins’ childhood; specifically, to one fateful day in middle school when Earn’s excitement over a new FUBU shirt took a turn no one could see coming — and helped define the duo’s relationship for life. Opening in a Marshalls (with a not-so-out-of-place city’s name scrawled on the wall), Episode 10 introduces Earn (Alkoya Brunson) as a happy kid who’s so excited to find a FUBU shirt he can afford, he can’t even sleep the day before he gets to wear it. With a smile on his face, the middle-schooler bounces onto the bus and receives a quick compliment from his friend — before an innocent action creates an ominous reaction. Sure, the kid who threw his yogurt out the bus window should’ve a) known better than to litter, and b) really known better than to gently drop trash out the window of a long bus, but the punishment didn’t exactly fit the crime. Not only did he get punched by the kid who was sprayed with yogurt, but his head slammed into the bus window, too. Earn timidly watches, and this quick reaction foretells both the kind of violence threatened later on as well as the rational disconnect between crime and punishment. After a few compliments from his classmates, Earn notices another kid, Devin, has the same FUBU jersey; only Devin’s jersey has a patch and more stripes. This triggers an instant investigation from their classmates, but no one can tell which is the fake; no one, that is, except Johnny (who apparently just knows this stuff). Afraid and embarrassed, Earn goes to his cooler older cousin (played by Abraham Clinkscales) for help. “I’m serious, Al,” Earn says. “I need some help. I’m not cool like you.” “How cool is the other kid?” Alfred asks. “He’s pretty cool. He always has dope clothes. His dad is like 30,” Earn says. Alfred tells him not to act nervous — confidence can be convincing, but Earn doesn’t listen (or can’t). He tries to hide his shirt and make a run for it after the final bell, but he’s stopped in the hallway. Johnny is there, and he says Earn’s shirt is the fake. That’s that. Earn walks out of school unharmed and even gets the number of a girl who wouldn’t have gone out with him had his shirt been fake. As Earn looks on from the back of the bus, he sees Devin being harassed by older kids as he tries in vain to defend the legitimacy of his clothes. The next day, he hears the news: Devin killed himself the night prior. The principal tells the class they’re “heard a couple things” about why he might’ve done it, including his parents’ splitting up, but Earn knows what happened with the shirt couldn’t have helped. He felt the same fear Devin did, but he got away with it. And even though everything up to that point in the episode emphasizes the importance of money and status within his community, Earn hears it all over again when he comes home. His mother is sitting with her sister as Alfred watches TV in the living room. Not only do they push the importance of clothing and looking good “as a black man in America,” but Earn’s mom buys him another FUBU shirt. Yes, it’s another opportunity to get caught, but more than that, it’s a reminder of what he went through with the first shirt. Considering it all takes place in the past, with younger actors taking over the series regulars’ roles, “FUBU” is a solid standalone episode. It hits hard with its messages about bullying, appearances, and empathy for others. One day, Denisha (Kailyn Brianna Gainer) is down beyond salvation; the next she’s chipper and eager to participate. We don’t know why, just like we don’t know why, exactly, Devin was pushed over the edge. What we do know is what nudged him closer to that point: a toxic obsession with status — with just the appearance of status — that stems from a repressive state of suspicion. Erica, the girl who “likes” Earn, only seems to care about him if he’s got money; status; something to offer. Meanwhile, the white kid doesn’t know why Earn’s struggles are so dangerous. Even if you fell into that camp before “Atlanta” started, by the end of the episode, we all get it. That’s one of the series’ best qualities — forming stories to help people understand one another — but “FUBU” also shines for tying itself to “Robbin’ Season’s” larger arc. What you do as children can often carry over into adulthood, especially if a certain dynamic forms early on and the two who share it remain friends. In the present, Earn and Alfred aren’t getting along. Alfred feels he’s missed out on professional opportunities because he’s stuck by his cousin, and Earn thinks Alfred doesn’t see how he’s trying to save every single dollar. “FUBU” brings the audience into the core of their relationship: Alfred has always been cooler than Earn, and therefore he’s always looked out for him. That can get old if the uncool kid doesn’t pull his own weight, and Earn has spent Season 2 looking for respect any way he can get it. He feels like he’s earned it after finding some success as Alfred’s music manager, and yet he can’t see beyond his own point of view. What Earn doesn’t realize is that he’s lost the respect of his cousin. Alfred saw kids being unfair to Earn and stepped in to protect him, but if he thinks Earn isn’t being fair to himself (or to Alfred), where’s that leave their relationship? How long does Alfred have to abide by his mother’s advice to look out for his cousin? The season has been driving toward this question through 10 episodes — whether or not Earn is dead weight on Alfred’s career — and next week’s finale will certainly provide some form of an answer. Earn may struggle to see the big picture, but “Atlanta” always does. There’s a lot to unpack in “FUBU” (especially when remembering the letters were once believed to mean “For Us, By Us”), but there’s value in the specific story and the larger one. Clothes are important, but so is family. “Atlanta” airs new episodes Thursdays at 10 p.m. ET on FX. Next week (May 10) is the Season 2 finale.